A liver ultrasound can uncover abnormalities, but it will most likely preclude more function tests and perhaps a biopsy. Some people may search the web under "ultrasound of liver". It is the largest gland in the body, which is on the right side under the lower ribcage. It weighs about 3 pounds and is reddish-brown. It has two sections called lobes. 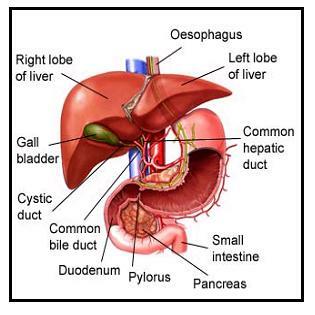 The liver helps to digest and process food by secreting bile. It is important to metabolize protein, chemicals and carbohydrates. It filters blood and its proteins are important in blood clotting. Cirrhosis: Long-term damage to the liver from any cause can lead to permanent scarring, and the liver will work well. Gallstones: If a gallstone becomes stuck in the bile duct draining the liver, hepatitis may result.